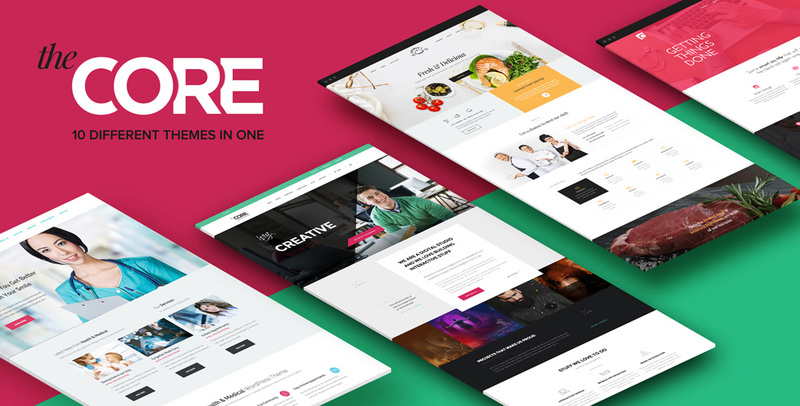 The Core is a newly released multi-purpose WordPress theme. This theme is really impressive since it comes with 10-built in templates created around the needs of all sorts of corporate, creative, food, event, medical and other niche oriented blogs. So if you’re looking for a flexible WordPress theme for your business, then take a look at the below review as The Core could be just what you need. The Core comes with an awesome tool that gives you the possibility to auto-install the demo content ensuring that the theme not only will look as in the live version, but also will work in the same way. This theme is integrated with drag and drop page builder tool, so you can easily customize it without editing a line of code. The Core was built on the open source framework called: Unyson. So this framework is available as a free plugin anyone can use. With The Core, your site will be fully responsive and compatible with any hand-held devices. The Core is optimized to support WPML or any other plugin, thus it’s entirely translation-ready offering the possibility to create multilingual WordPress websites. In the theme package are included three different sliders. The two best-selling slider plugins: Slider Revolution and Layers Slider; and a custom-built version of slider developed by ThemeFuse team. You can design the best online shop as The Core theme is compatible with the WooCommerce plugin. The Core is integrated with a SEO module that will help your website get more visitors form search engines. Design your own website at your will. The Core lets you choose among 4 header types and lots of footer options. The color picker option allows you to change with ease the colors of your website. If you change a specific color, all the instances of that color will change all over the site. Thus, you can create a perfect feel and look for your website. If you’re looking for a modern, easy customizable and really versatile WordPress theme for your project, take the chance and try it for free at ThemeFuse Lab for 14 days right now.